A big tide predicted and an east wind overnight (with building cloud after a clear evening) meant that a trip around the patch was very much in order on Tuesday morning. There just had to be new birds about - and there were! Down to the shore first to check the flats for migrating waders. 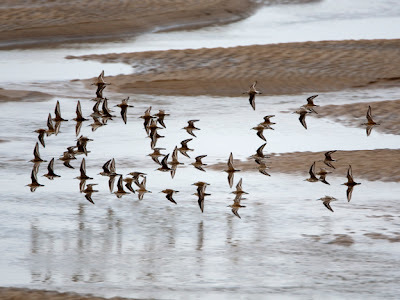 Not disappointed either, absolutely hooching with passage Dunlin. Golden backs and black bellies on many. Thier summer plumage looks slightly out of place on the grey beige mudflats, but that is fine, they'll soon be swapping them for uplands and moors, full of golden grasses - perfect camoflague. The tide races in and soon the flats disappear under water, but not before we are treated to a great spring migrant. 20 treats in fact. Whimbrel, 20 of them, are forced off the mud and into the marsh piping their 7 whistle calls as they go. This has been a great start to the day. What's next? Up on to Heswall Fields and we head inland. The big clumps of Blackthorn here should have pulled in a migrant or two. Again we are not disappointed. A distinctive call reaches my ears. Unmistakable. A short warble followed by a rapid series of chirrups. 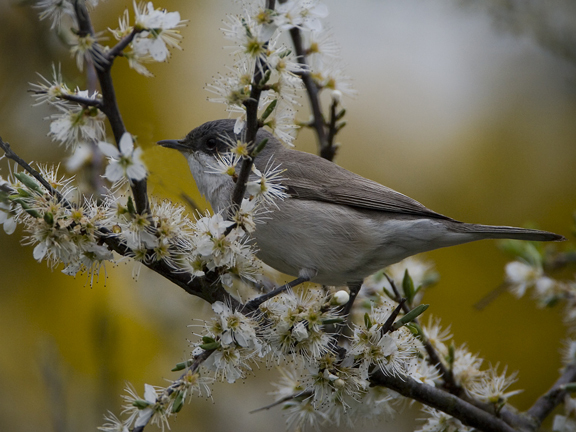 Lesser Whitethroat! Wonderful! I'm not expecting to see it though, they are notorious skulkers. However we are treated to a couple of fine, but brief, views. 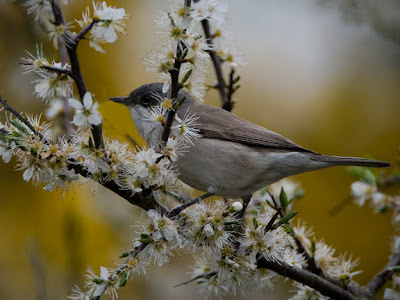 Much plainer and greyer than the Common Whitethroats that I was stalking 24 hours previous, but I think I prefer the subtler tones of grey on this scarcer species. With the overnight combination of SE wind and clear start turning cloudy, there is a good chance of a fall of migrants. I fancy that the ploughed field between the cliff and the Wirral Way is our best chance of success. With the warm sunshine there should be plenty of insect food on offer. 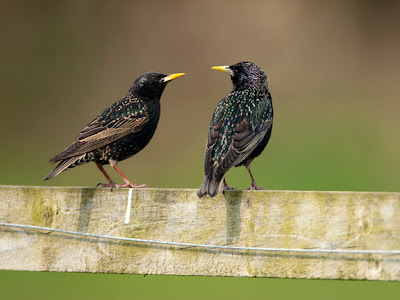 As we approach a few Starling fly up from feeding to watch us from the fence. The sunlight turns them from black to iridescent purples and bottle greens. Feathers are tipped with a golden arrowhead that will wear off as the stress of breeding takes its toll, but for now they lend a tropical touch to this English countryside scene. Again things go our way and we strike it lucky on the field. 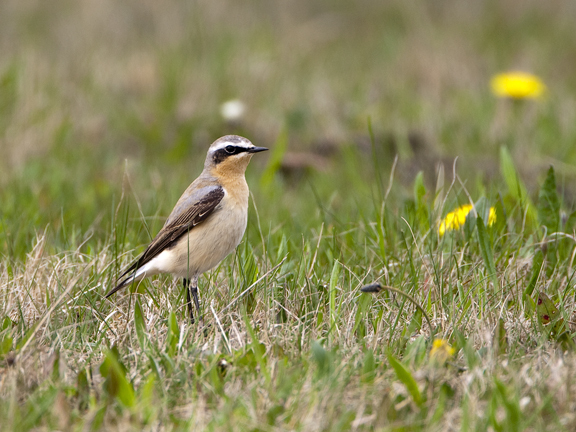 We run into a fall of Wheatear. I've been lucky enough to have a few run ins with this quintessential spring migrant over the last few weeks, but this is head and shoulders above anything I've seen so far. There are 31 in total and they are all in one portion of the field. The spring sown crop is just coming up in neat little rows and the birds are easy to spot. Up to 5 can be seen in one binocular view. Stunning! They dart from furrow to furrow in pursuit of prey. As you follow one with the binoculars you come across another dashing in the opposite direction. Every now and then one flutters a couple of feet in the air and snaffles a passing fly, it is fantastic to watch. It feels special because this opportunity is so fleeting. Pretty soon they will be gone and we have run into them on a brief re-fuelling stop. The sun is really strong, I can feel the back of my legs burning. Shorts were a good idea, forgetting the sun cream a bad one. This strong sun is creating a massive heat haze over the field. It shimmers intensely, animating the static branches of the willows by the pond in the middle of the field. In fact the field in this haze looks like something from a wildlife documentary filmed on the African savannah. It strikes me that the Wheatears will have travelled from similar areas not too long ago. For these few hours the cliff field must feel like a real home from home for the birds.